I've always lived two lives , the one at work and the one at home . Since my cancer , these two worlds have been colliding , playing havoc with my heart . I just can't be these two people any longer . Whether we are at work or play , the world is full of critics . There is always someone who thinks they can do your job better , think smarter or act quicker on a deal . No matter how perfect of a review a person has , it always ends with " there's room for improvement in ....."
I've often wondered how people could last 25 years in one company without losing their mind . Since this year marks my 18th with my company , I think I'll be finding out soon enough . How does a person stay fresh without the feel of burnout ? That was me this morning . When I walked outside and saw a raging storm and flooding streets , I saw God's power . As I drove in it , all I could do is pray . I prayed and called out His name all the way home . When I arrived safely an hour later and opened up my daily bible verse ( see above ) , I've realized how true it is . I can't recall a time in my life where I haven't called out in prayer to God . Whether it was a physical health need or thankfulness or a prayer request , He has always been a part of me . My relationship with Christ has become more private , endearing and loving as I age . One of my childhood memories happens to be of waking early to the clip-clopping of the horses hooves upon the cobblestone street in my hometown of Niedzieliska , Poland . My grandmother downstairs in the kitchen churning fresh butter for the day . The memory so fresh in my mind as if it happened yesterday instead of thirty-odd years ago . There is something so comforting and so relaxing about waking early in the morn when the sky is still dark with night . No human life is seen outside nor any car is heard driving away . Where the only sound is the chirping of the birds welcoming the new day . There is a cool breeze swaying the curtains of an open window before the heat of the day begins . Only in the summer can we enjoy moments like these . Moments where we sit reclined in our favorite chair sipping our coffee waiting for the world to stir from it's slumber . A world that looks so calm , so serene , so unlike itself . A world filled with God's beauty . I have a treasure . It does not consist of a bank load of money . My chest is not full of jewelry . I do not own a huge and beautiful house that is filled with expensive furniture . My treasure lies within the arms of grandchildren , who freely wrap them around me . Grandchildren who look at me with love in their eyes . Grandchildren who want to know me . My treasure is a red Durango with God sitting behind the wheel . There is no other reason why it starts when you turn the key . A red Durango that has carried my belongings as I traveled the road of life . My treasure is my crocheting hook that offers comfort to me as well as others . It was learned in childhood , brought out from illness and used for good . My treasure are letters that can form words . These words tell a story of my life with cancer . You can see these stories on a blog where they are used as an expression of my innermost emotions . "I wouldn't call it the brave choice. I actually think it’s the most fearful choice you can make when confronting anything with cancer," she said in the last question of an interview with The Washington Blade writer Joey DiGielmo. Etheridge added that she believes cancer is triggered as much from mental and physical health as it is by genetics. "Plenty of people have the gene mutation but it never comes to cancer, so I would say to anybody faced with that, that choice is way down the line on the spectrum of what you can do and to really consider the advancements we’ve made in things like nutrition and stress levels. "I've been cancer-free for nine years now and looking back, I completely understand why I got cancer. There was so much acidity in everything," she said. "I really encourage people to go a lot longer and further before coming to that conclusion." Life has certainly seemed brighter in the last few days . I've been around long enough to know that moments like these are fleeting . We need to enjoy these moments before they disappear . Life is a series of mountains with plenty of ups and downs . Right now , it's up . Yes , life is brighter . My last chemo treatment ( for now ) will be next week . Although I'm tired , my body is recovering nicely and I'm looking forward to being in remission . Remission instills a renewed energy boost within me . Like a kid housebound , when the door opens to the outside , we run out to explore . There are no limits . That's what remission feels like to me . My bedroom is coming together quite nicely . That huge file cabinet has been taken out to the trash by two big strong males , Tony and Junior . God Bless real friends . The biggest change ? I feel comfortable in my room . Six years ago , I had a hysterectomy which resulted in an instant menopausal state . I was fine until my first chemo two months later . Of all the symptoms of menopause , weight gain and hot flashes are prominent in me . Hot flashes : what can I say . . . I can't remember the last time I was cold . I'm hot all the time , breaking into a sweat at the slightest physical exertion . I don't have a blanket or comforter on my bed , but use a sheet instead . In the wintertime , I wear halter tops and shorts around the place . Emily gets shivers just looking at me . There are times I have to turn on the ceiling fan to cool off . I can deal with all of that , but the red side burns on my face is just too much . I'm 48 years old and I look like I'm a pre-teen with her first crush . When I take steroids , my face becomes even redder . As I crawled into bed this morning , I knew I never wanted to leave it . Tired and achy from working the weekend overtime , the last thing I wanted is to go bowling with the kids . 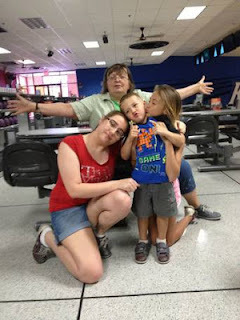 My great-niece and nephew from Florida were visiting and we promised them a family outing bowling style . At this point , everyone was excited . Teams were formed and named . There were " The Knockouts " ( Destiny , Emily ) and " The Fala's " ( Myself , Faith ) . My nephew Ashton 's score would be split in half between the two teams . Tired , I might be , but the show must go on . Once we got there , I had a blast ! Bowling turned into a spaghetti dinner , picnic style in our living room . After dinner , a game of LIFE , what else ?! Did I get any sleep ? Makes absolutely no difference , because what mattered most was the fun time we all had with each other . Making beautiful memories . . . isn't that what it's all about ? Whenthe cancer returned this time around , I made a decision not to fight it , but start learning how to live with it . My main goal was to be able to work and not look like a cancer victim . I wanted to walk among others blending into the scenery . Unfortunately , the victory is a bittersweet one . I think I've achieved this goal a little too well . Take work , for instance . Sometimes , I believe that my superiors have forgotten that I have an illness . This is a huge compliment regarding my capabilities in performing my duties . Still , I feel they have no idea what it takes to achieve that on my part . Isn't this really what I've wanted all along ? Then why am I complaining ? On those particularly challenging days when your body isn't cooperating , there is a teeny weeny part inside of you desiring sympathy . None is offered . People dream of winning the lottery or retiring early , I dream of traveling the States . I would love to spend the summer traveling in an R.V. enjoying the beautiful scenery . My traveling companion ? My mom . My mom is the perfect person to take traveling . She comes prepared with a basket of goodies in case one gets thirsty or hungry , ready to pull out that sandwich or pour that cup of coffee . It makes no difference if it's only an overnighter , she still carries enough luggage for a weeks stay . You want to read a magazine ? She readily pulls out the latest issue of a Polish magazine translating if needed . Your button fell off ? It's raining ? A toll suddenly appears ? Don't worry , mom has everything you need right in that luggage . The game of Life sits atop our shelf in the living room . Whenever , I make a comment to Emily of having a quiet night in , she instantly reaches for that board game . She loves board games , card games , any kind of games . Not exactly what I had in mind when I said a quiet evening . Everytime we play , it's a different result . Either we end up wealthy with lots of kids or poor with none . It makes no difference how many times we play , the game of life is never the same . That's just how real life happens to be . No matter how much you try to plan , it doesn't always turn out quite the way you expected . We all start off the same way , by coming into this world , and yet our lives are so very different from that point on . Sometimes , a girl needs to throw out her diet and healthy living . Sometimes , eating double-stuffed oreos , couple of glasses of red wine , followed by a bag of chips is all a girl needs to say the heck with it ! There are days when we're too lazy , too tired and too fed up , to take a shower or wear any makeup . Days where we sit upon our arse in mix-matched clothes that should have been in the dumpster . The doorbells buzzes , they'll leave eventually . The phone rings , leave a message . We turn off all communications with the rest of the world . No facebook , no e-mails , this is a no trespassing zone . Instead , we 'll sit and watch sappy Lifetime movies where we can cheer on the long suffering heroine and boo the evil villain . We can get happy , sad or angry or shed a couple of tears . Yeah , it doesn't get any better than this . These past couple of days , I have been home recuperating from a treatment . Nothing new there . It happens every three weeks . What is new is how productive I have been during this time . I'm not doing anything strenuous , just crocheting . Deep down inside , I know what's behind all this renewed energy , even with chemo . My mind has been preoccupied with all that's been going on , leaving my mind a total blank concerning other things . This blog , for instance , has been one of those things . Lately , it seems , I sit down and stare at the blank screen with a blank head . Forming words , thoughts or ideas has become a real struggle . That's why crocheting is the answer for now . It always has been my relaxer and that's where I need to be . I didn't plan on going to Church today . My plans were merely to sit at home , crocheting quietly in my room . Nothing more , nothing less . At seven in the morning the call came from one of the teachers , she couldn't make it in this Sunday . When the second message came , I knew all my plans would go on hold and I needed to go in . Lately , being quiet is all I strive for , looking for peace in my everyday life . I want to sit in my room , with the door closed , surrounded by things I love to do . Any issues with others to be left outside my building where it cannot touch me . People disappoint . How am I to deal with others jealousy ? Jealousy turns into envy , then anger and vindictiveness . How am I to deal when others do their best to hurt you ? How many times can one turn the other cheek ? Whenever I have a chemotherapy session at the clinic , I get many offers from friends to come along . People care and it's very evident in their actions and their words . The truth is I like going alone . I think of it as my alone time , almost like a spa treatment . I bring with me my bag of goodies and entertainment items . Sometimes after a particularly difficult week at work , I look forward to my chemo . Having cancer for six years now is actually an advantage , because I have gone through so much that I feel completely at ease with my situation . We have become friends . The day itself is really spent visiting my friends . My doctor and nurses are awesome and we play catch up with each other's lives . My doctor measures my progress on whether I crochet or not . Yes , I'm known for my crocheting and that seems to be the topic when I'm there . Everyone keeps popping in asking , " What are you working on now ? " Sitting on my daybed , looking around my bedroom , I let out a deep , weary sigh . Half the room is spotless and the other half a total chaos , piled high with clothes , knick knacks and just stuff . I have decided to change out my bedroom . Ever since , we have moved in here , I haven't been able to feel at peace in this room . Something is not right here . I have rearranged this room numerous times and I'm still not happy here . I think it might be because this room doesn't look like a bedroom , but an office . Finally made the decision to get rid of the office size filing cabinet . I have pushed it out into the hallway where it is currently blocking all traffic . How am I going to take this huge thing out to the trash ? It's moments like these that I wish I was married . Although , many of married friends have told me it means absolutely nothing , but that's another blog . I'm sure that all of you have noticed how somber I have been feeling by the types of blogs I have been posting . Sometimes , life just crumbles all around us and we cannot stop it . When it rains , it really pours ! Last night , I received this poem from a lady that I really admire . It made me realize that no matter how badly things may seem , they're never as bad as they can truly be . I hope that makes sense to you , because it does to me . Today, upon a bus, I saw a very beautiful woman And wished I were as beautiful. She had one leg and used a crutch. But as she passed, she passed a smile. Oh, God, forgive me when I whine. I have two legs; the world is mine. I talked with him, he seemed so glad. If I were late, it'd do no harm. What can a person make with a basket of colored remnants of yarn ? None of them matching in styles or textures , just an assortment of leftovers . No one likes leftovers , right ? I'm talking about the yarn I bought at the estate sale months ago while looking for my couch . This yarn is awesome looking , unlike any that I have seen . This yarn looks expensive . The problem ? Not enough of it , only remnants . Emily has always shown an interest in serving the homeless , sharing her desire to go out and minister to them in some way . 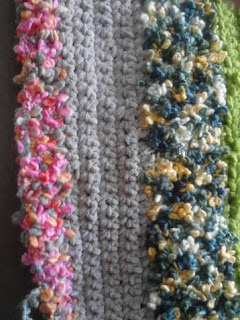 I thought that maybe , I could make some blankets for her to distribute to them . In doing so , I have discovered how much I missed crocheting blankets . Blankets happen to be what I first started making when I learned the actual craft . My children are grown and if you're like me , you reminisce of when they were small . You remember all the good times you've shared together . I really miss the quality conversations where secrets were confided and future plans were discussed . My presence was in demand and no one could lend an ear better than mom . Now that my son is married , the dynamics have certainly changed . The time I used to spend with him , has been replaced with Aubrey . I love my daughter-in-law and we have a very special relationship which only deepens as time goes on . Yet , there are moments when I miss that one on one that Joe and I used to have . In the news , the other day , was a death announcement for Jean Stapleton . Immediately , I received a text from my son , bringing back memories of his youth . When Joey was small , he absolutely loved Archie and Edith Bunker . Since the show was on late at night , I would tape it for him to watch the next day . I could hear the birds singing , sending a signal that morning is coming . It's been a long , thoughtful night . Sleep came hard . The devil knows our weak spot and tries everything to steal our Joy . Sometimes , we have so much weighing on our hearts and minds that we can't think straight for all that clutter . We have prayed and prayed unceasingly for so long , all words have left us . That's alright , God can read our mind . Breathe in , breathe out and get up to face our day . We can spend too much time over - analyzing , over - strategizing our situation . The fact is , the situation will never be resolved the way we want it to be . We need to wait and let God handle it the way He wants things to turn out . work night to commence . and pack my lunch , too .
" Oh no , it's almost here ! " But wait ! A raindrop ! Then lightening and thunder ! Come on traffic signals , turn green ! I see lights out everywhere ! Yes , there is a glimmer of hope yet !